St James’s Hospital is embarking on a new period of its existence as any visitor to the Dublin 8 site cannot fail to notice. However, as development of the National Children’s Hospital (NCH) continues, a new book looks back on over three centuries of fascinating medical history on the site. “The hospital has developed an awful lot over the last 40 or 50 years,” Prof Davis Coakley told the Medical Independent (MI) when asked why he thought now was a good time to write a new history of the hospital. Prof Coakley was formerly a consultant physician in St James’s Hospital and Professor of Medical Gerontology in Trinity College Dublin. He is the author of numerous books on medicine, the history of medicine and Irish literature. “This seemed an opportune moment to look back on what has been achieved [over the last half century]. But also, St James’s has a heritage a couple of hundred years before that,” said Prof Coakley who has co-authored The history and heritage of St James’s Hospital, Dublin (Four Courts Press) with his wife Mary. Ms Coakley studied English and Italian in University College Cork and has worked with her husband on a number of literary and historical projects. “It has taken time to explore that background; because it was founded in 1703, we needed time to do research. We were doing research for a number of years and it has all come to fruition. It really is the end of a fairly long process of research and writing. Prof Coakley said that during his time in St James’s there was something in the caring tradition of the hospital and the physical buildings themselves that sparked his interest in the past. “When I came back to St James’s from the United Kingdom as a young consultant, I was amazed at the standard of care that older people were getting from nurses,” he recalled. “The nurses were so committed to care for older people. Why that came about interested me. Of course a tradition had developed [over time], particularly in St Kevin’s where a lot of the poor were old and without any kind of resources and the nurses had a very dedicated and caring attitude towards the patients. During his time at St James’s, Prof Coakley was a leading force behind the establishment in 1987 of the Mercer’s Institute for Research on Ageing in St James’s and which later became the new Mercer’s Institute for Successful Ageing (MISA). “The other thing that interested me when working there was, of course, the actual physical facilities in the hospital, which were mainly old workhouse buildings,” he said. The history of St James’s Hospital stretches back to 1703 when legislation was passed to build a workhouse on its site. Just under 30 years later a foundling hospital was added to the workhouse. The opening chapters of the new book discuss this period and the pitiful treatment of abandoned children. When asked what was the most interesting period to look into during the research, Prof Coakley said it was these difficult early years. “Well, I suppose I found the original period to do with the foundling hospital most interesting, I knew very little about that,” he told this newspaper. “We still had buildings from that period from the 18th century, quite a number around the hospital and I’ve worked in those buildings and always wondered what they were used for. I wondered what went on there. “The whole story of the foundling hospital is very interesting. It was set up originally because infants were being abandoned in doorways and along the banks of the canal after birth. “In 1703 a workhouse had already been established in St James’s, it was quite a fine building. It was built just outside the gates of the western entrance to the city. It was to get people going in from Galway and the south-west. If people didn’t have enough means of support, rather than being allowed into the city to beg, they were put into the workhouse. At the time beggars were perceived as a major nuisance [by the authorities] and it was used to move them off the streets of Dublin. “Then after 30 years the [abandoned] children issue was becoming more pressing. So they decided to also use the workhouse for the care of abandoned infants. Prof Coakley said that a foundling hospital was different than our modern sense of a hospital. “It’s an institution to look after abandoned infants, who were usually found in the door of the church or wherever. It wasn’t an infirmary in the modern ways we would think of an infirmary. It wasn’t a hospital in the sense of a modern hospital,” he explained. When the foundling hospital was closed in 1829 the buildings were used to house the South Dublin Union Workhouse. The workhouse played a crucial role during the Great Famine, giving shelter to thousands of starving people. “What happened was that in and around the 1830s the foundling hospital had gone through several changes and a lot of children were now developing into teenagers and being sent out as apprentices around the country,” said Prof Coakley. “It was becoming very costly for the government to maintain it. In the end they decided to close it and say these infants were now being cared for in other institutions, etc. It was finance in the end that made them decide to close it, not the scandals that had been going on for the previous hundred years. “The building was empty in the 1830s. In 1840 when they decided to set up a workhouse system here, similar to the one they set up in the UK, despite a lot of objections, the buildings of the old foundling hospital were used for the new South Dublin Union Workhouse. Then after the Famine a major cholera outbreak (see accompanying extract on page 14-15) added to the public health woes for medical authorities. Doctors were at the frontline during this outbreak and some lost their lives. Reading the account from Prof Coakley’s new book, it is hard not to be struck by the comparison to contemporary events, such as doctors who have lost their lives in Ebola and Zika outbreaks. Prof Coakley also sees the parallel. “Yes, it is comparable to Ebola, in that doctors really put their lives at risk,” he said. According to Prof Coakley, a famous physician from the period “described the mortality rate of doctors treating things like a cholera epidemic as being twice that of officers in the field of battle… for these doctors there was no such thing as their pension after that, their families were left without any support in very dire circumstances. It was not until the early decades of the new State that the institution that we now recognise very much as St James’s finally took shape. “The [new] State was in a very poor state,” said Prof Coakley. “There were an awful lot of slums in Dublin. The people were living in just dire poverty. There wasn’t a lot of funding around to remedy the situation quickly. But the State was concerned that the very poor were not receiving treatment and [about] those living in the tenements who had no resources. “They were anxious to develop a municipal hospital, which would focus on the care of the very poor. St Kevin’s started to emerge as a concept before the Second World War. “Then after the war, they began to knock [down] several of the very old buildings around the campus of what was the South Dublin Union and refurbish others, so they created what became known as St Kevin’s Hospital and this was a major hospital. In 1971 three of the oldest voluntary hospitals in Dublin, Mercer’s, Sir Patrick Dun’s, and Baggot Street Hospitals, amalgamated with St Kevin’s to form St James’s Hospital. 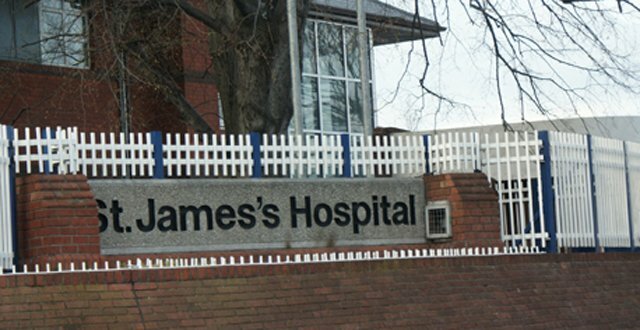 Over a very short period of time St James’s Hospital became the largest teaching hospital in Ireland. Currently, St James’s Hospital campus is entering a new era with the building of the NCH. “It’s ironic really, part of the development of the children’s research institute will be situated next to the infirmary of the foundling hospital, which is still standing,” according to Prof Coakley. He also mentioned the maternity care history that was in existence when St Kevin’s was open at the site. See http://www.fourcourtspress.ie/books/2018/st-james-hospital-dublin/ to purchase the book online.